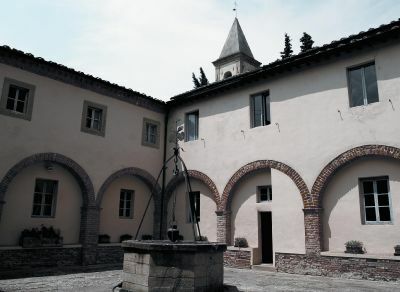 The Franciscan complex of the Sacred Mount of San Vivaldo, in the municipality of Montaione, is located in one of the most striking places of the Valdelsa. Declared a national monument in 1984, it is a cultural and spiritual point of reference for the whole province of Florence. 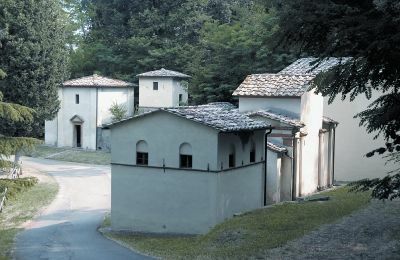 It rose at the beginning of the 16th century in the wood of Selva di Camporena (already considered sacred in Etruscan and Roman times and used by hermitic communities in the Middle Ages) as an exact topographic reproduction of Jerusalem and immediately became the destination of substitute pilgrimages to the Holy Land. For centuries, it has maintained the spiritual character that still today exerts a strong appeal. 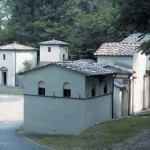 Records since the 13th-century mention the existence of a hermitage in these woods known as locus sancti Vivaldi and of a small church named Sancta Maria de Romitorio (St. Mary of the Hermitage) that was erected there no later than 1224. 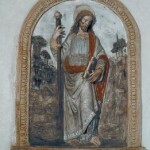 During the next century, devotion to Saint Vivaldus increased and the church was dedicated to him as well as to Saint Mary and Saint Catherine. The Selva di Camporena and the San Vivaldo hermitage were at the center of a dispute between Castelfiorentino and Montaione. Eventually the Montaione community offered them to the Franciscans who, in 1500, formally included the saint in their order. Thus began the construction of the church that incorporated the Church of Santa Maria del Romitorio. Since 1908, the relics of Saint Vivaldus have been kept in the chapel consecrated to him. Also found there is a glazed terracotta altarpiece attributed to Benedetto Buglioni depicting the Adoration of the Child with Saints Vivaldus and Catherine of Alexandria, dated to the early 16th century. In the same chapel is a fine panel painting by Raffaellino del Garbo representing the Madonna and Saints. 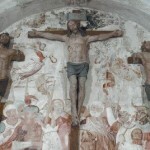 In an internal chapel to the right is a painted terracotta group depicting the Pietà carried out by Agnolo di Polo. 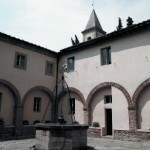 The San Vivaldo complex was built between 1500 and 1515. It includes the convent, in whose former hayloft the Museum of the Sacred Mount has been housed since 1993. It is arranged according to an iconographic and topographical plan faithful to the parameters of the earthly Jerusalem, in its reproduction of the holy sites, thanks to pilgrims’ and travelers’ accounts like Francesco Soriano’s diary entitled Jerusalem Traslata. 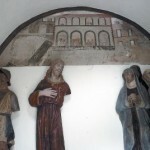 The Franciscan Brother Tommaso from Florence carried out the project. Today seventeen of the original thirty-four small chapels remain, with only thirteen dating back to the original project. With each chapel having the patronage of a noble Florentine family, they reintroduced classical structures endowed with a devotional character that was in contrast to the secularized rationalism of the Florentine Renaissance. Inside, groups of statues meet the visitor’s need for concreteness through these life-size figures. 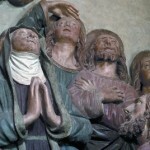 The sculptures depict episodes from the life and Passion of Jesus and are made of cold-painted terracotta, i.e., without glazes. 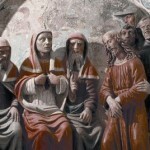 They are attributed to Giovanni Della Robbia and to his assistants and followers. A canonical itinerary to visit the chapels did not originally exist and the pilgrim’s course here, as in the real Jerusalem, followed the development of the evangelical narrative only in part. Over the years, there have been various paths, also because of the construction of new chapels inspired by Marian devotion or arising from popular initiatives. Thus, the complex has gradually moved away from the model of Jerusalem. The work is appreciated for the perfect fusion of sculpture and painting. 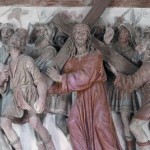 In the centre is the figure of Christ Crucified between that of the two thieves, in the background is a large group of figures crowd near the crosses. 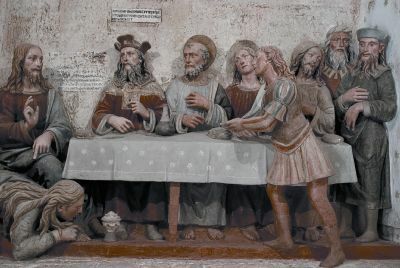 Located in a terracotta niche in the chapel of the House of Caiaphas, the relief, together with the one nearby of “Jesus Insulted”, depicts Caiaphas rending his clothes, according to a widespread practice in those days for expressing disapproval, after Christ has declared himself the son of God. Some have assumed an intervention by Benedetto Buglioni while others the hand of Agnolo di Polo. 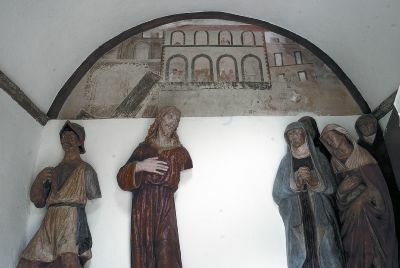 The Ecce Homo group is located in a niche at the entry door to the chapel in the House of Pilate. 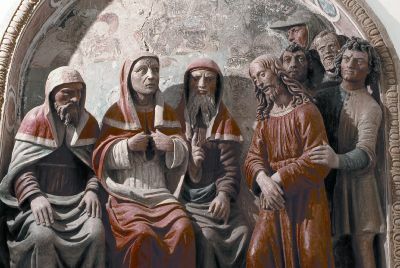 This extraordinary integration of painting and sculpture depicts the famous episode in which Pilate presents Christ to the Jews saying “Behold the man!” (In Latin: Ecce Homo). The relief is attributed to Marco della Robbia, Giovanni’s son. 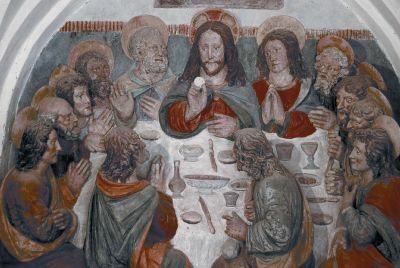 The pictorial background recalls the frescoes by Gerolamo di Romano, known as Il Romanino, in the cathedral of Cremona. 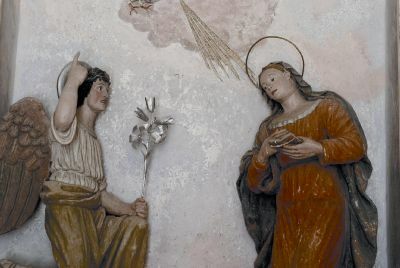 Located in the Chapel of the Annunciation, the two statues, modeled against an azure background, are in the center of a marble altar. Both sculptures are rather static and lifeless. Above the altar table in the chapel, the relief takes center stage. 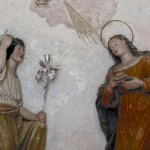 It recounts the famous Gospel episode through a composition constructed with such extraordinary clarity that it is considered one of the most beautiful scenes at San Vivaldo. It has been attributed to Agnolo di Polo, the sculptor recorded by Giorgio Vasari as one of Andrea del Verrocchio’s apprentices. 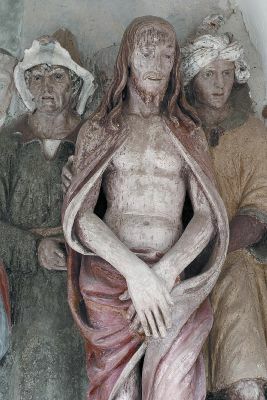 The relief describes the Gospel episode where Veronica, meeting Jesus during the climb to Calvary, dried his bloodied face with a cloth, its imprint remaining miraculously on the material. The relief’s composition is simple and rather elementary in its pictorial description of the landscape in the background. The relief is in a rounded aedicule framed by an egg-shaped decoration. 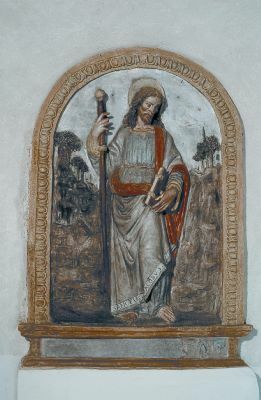 The saint, depicted with his typical attribute of a walking stick, is characterized by pronounced and irregular features, alluding to a profound interior suffering that, according to the critics, corresponds with the stylistic achievements of the Master of Bigallo. 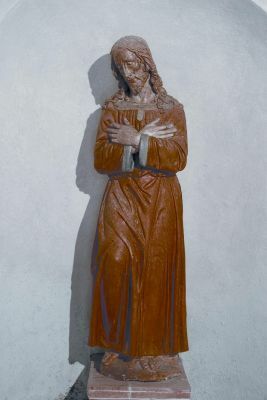 The statue is located in an apsidal basin in the Chapel of the Detention of Christ. 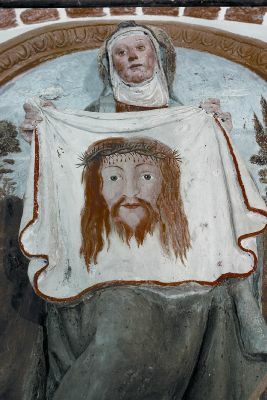 Depicted probably while praying, Christ’s face is hollow and exhausted while his body appears through the abstract folds of the robe. Doubtless, the figurative model of reference must have been that of a Florentine school more attentive to the formal harmony of the whole than to a realistic anatomical representation of the subject. 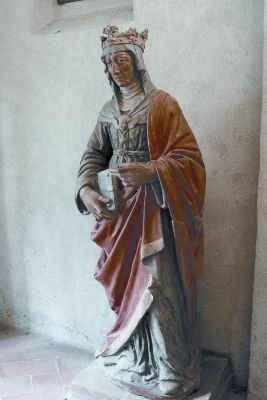 The statue depicts Saint Helen, Emperor Costantine’s mother, who, in the 4th century, found the cross on which Jesus had been crucified. The sculpture, now inside the Chapel of the Holy Sepulcher in the popularly named Chapel of the Angel, comes from a chapel dedicated to the empress that no longer exists. 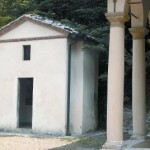 Under the Rossi family’s patronage, the chapel is a sloped-roof house with a door and two windows on each side of the house. In order to give the impression of a sumptuous palace courtyard, such as Pilate’s actual residence in Jerusalem probably had, the hall-like interior is subdivided into two spans with rib vaults. 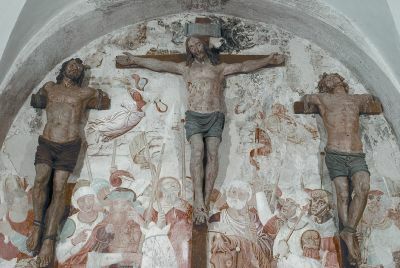 Here, in two niches, are depictions of the Flagellation of Christ and the Crowning of Thorns. Inside a rounded niche in the Chapel of Ascension, the relief is a detail of the episode depicting the Resurrection. The Madonna and the apostles witness the event with amazement and joy. 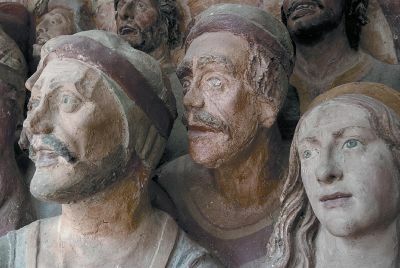 This terracotta sculpture is part of the oldest cycle in the San Vivaldo complex, carried out under the direction of Giovanni Della Robbia and his three sons Marco, Lucantonio, and Simone. 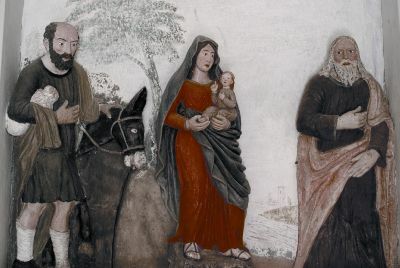 The relief presents Joseph and Mary, holding the Infant Jesus in her arms, preceded by Saint Anthony the Abbot, whose inclusion is justified by the saint’s widespread veneration in this area. Simple and not too refined, the sculpture is signed on the Virgin’s pedestal, with the inscription “Marianus Bondi fecit / A.D. 1836 Vola Terrano”. The convent’s original construction dates to the beginning of the 16th century, but over the following centuries there were various remodelings and enlargements. It was the seat of the Franciscan Seminary until the last world war. 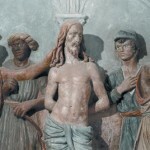 The image, a detail of the relief in the aedicule in the Chapel of the Way to Calvary, narrates the episode when Pilate leaves the decision of Christ’s fate to the crowd. The union of the background painting and the sculptures is perfect. 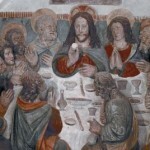 Critics have suggested Benedetto Buglioni, founder of a workshop in competition with the Della Robbias, for the sculptures, and Antonio Bazzi, known as Sodoma, for the painting. 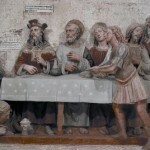 This terracotta relief is found on the back wall of the Chapel of the Last Supper. The material’s ductility and its energy allow the figures to be variously characterized, contrasting with the rigidity of the objects on the table, which correspond faithfully to those in use at that time. Comparisons evoke late Medieval northern European sculptures as well as coeval pictorial models. 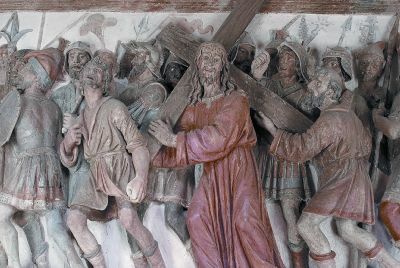 The painted terracotta sculpture describes the journey to Calvary and is located in the San Vivaldo chapel of the same name, under the Baldini family’s patronage. Here too, as in most of the San Vivaldo reliefs, Agnolo di Polo’s hand has been recognized, whose work with the Della Robbias in 1517 has definitely been confirmed. 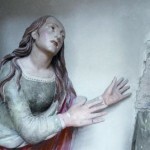 With her broad, serene face, the naturalness of her manner, and the definition of her body hidden under the large cloak, this statue of the Magdalene recalls iconographic models referable to Agnolo di Polo. 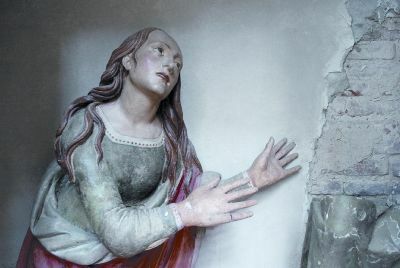 This sculpture, together with that of Christ, narrates the Gospel episode of the meeting outside the sepulcher of the Magdalene and the risen Christ who urged her not to detain him (“Noli me tangere”). 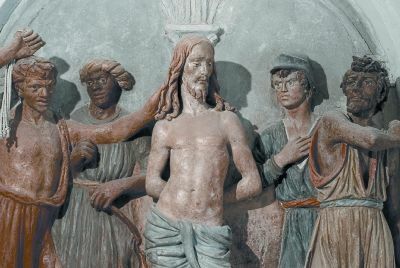 Depicted in one of the niches in the Chapel of Pilate’s house, this relief tells the story of the Flagellation of Christ. The balanced and harmonic composition is created particularly through the correspondence of the opposing gestures of the two flagellants, as well as by the expressive rendering of all the figures. The scene is attributed to the Verrocchiesque plastic artist Agnolo di Polo. References to Benedetto Buglioni, who had trained in the Della Robbian entourage, are also recognized. This group of figures with the Madonna dello Spasimo represents one of the highest achievements of San Vivaldo’s entire sculptural cycle. 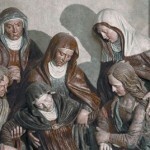 The extraordinary compositional rendering can be seen in the varied movement of the heads, in the soft breaking of the robes as well as in the different depictions of the faces. Critics first attributed the work to Giovanni Della Robbia and later to Agnolo di Polo. 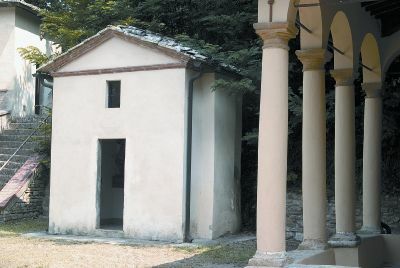 The chapel, although small, was carefully planned using the Florentine braccio unit of measure. Inside, a relief depicts Christ being dragged by a jailer, while he turns to console the Pious Women who, prostrate, are following him. 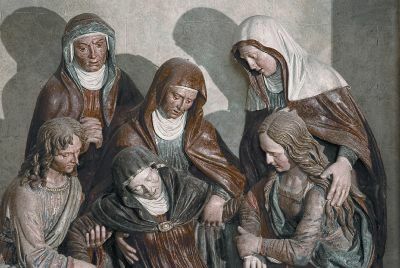 The relief depicts the scene where Christ is being dragged to the Calvary by a jailer, while he turns to console the Pious Women of Jerusalem who, prostrate, are following him. 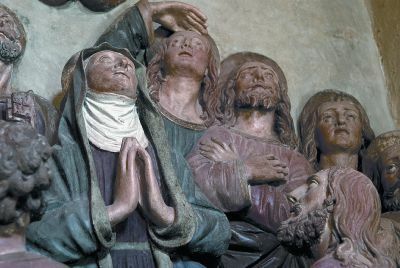 Although the arms are missing, the statues of Christ and the jailer maintain intact their expressiveness, while the varied positions of the Pious Women ensure dynamism to their depiction. By car: from Florence, take the highway Firenze-Pisa-Livorno (FI-PI-LI). After about 13 Km, exit at Ginestra Fiorentina. After about 800 metres, turn right into Via Virginio following the signs to Montespertoli and from there to Castelfiorentino. Once in Castelfiorentino, follow the signs to Montaione (9 Km). complete or short guided visits every hour from 10 a.m. to 4 p.m.
complete guided visit: 4 p.m., 6 p.m.
short guided visit: 5 p.m.
complete guided visits: 2 p.m., 4 p.m.
short guided visits: 3 p.m.
From June to September, upon reservation, night guided visits from 9 p.m. to 11 p.m.
Reservations for groups of over 30 people are welcomed. Combined ticket with the Civic Museum: full price: € 4.50; reduced price: € 3.00. System Museale Valdelsa Fiorentina card: full price: € 10.00; reduced price: € 8.00. Combined ticket with the Civic Museum: full price: € 3.00; reduced price: € 1.50.